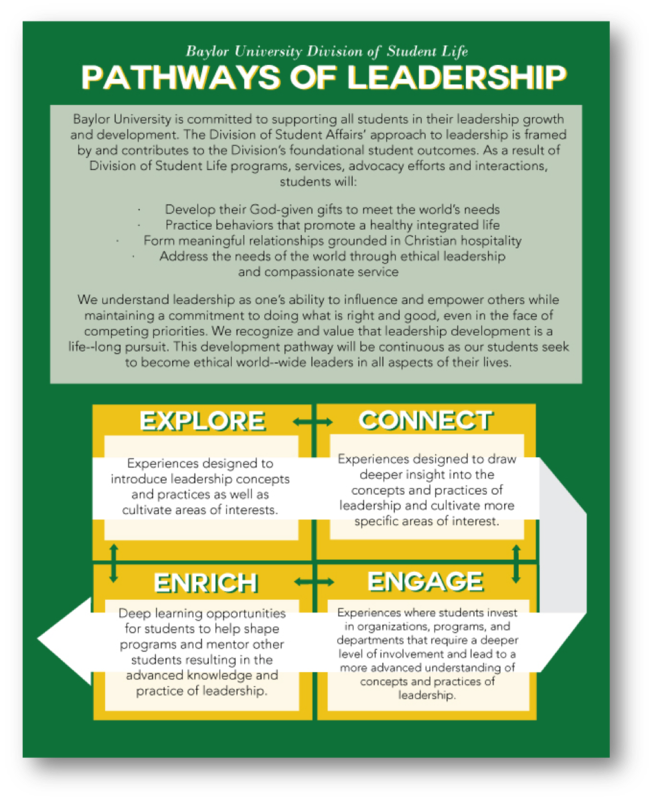 As we seek to cultivate global citizenship, build community on campus, help students understand calling and develop the whole student, the Student Life Division seeks to instill Baylor graduates with the ability to lead and serve by developing and implementing a comprehensive multi‐year leadership framework, "Leadership Pathways". "Leadership Pathways" represents a well thought out and wide‐reaching model of leadership and service that serves as the foundation upon which divisional programs, services, and experiences are planned, resourced, implemented, and assessed. Integrating the foundational principles of the Christian faith with the ability to navigate within a complex global society will result in leadership pathways that shepherd students to graduation and beyond.